This section provides an tutorial example of using 'figure' and 'figcaption' elements in HTML documents to present contents as reference blocks. "figure" elements are added in HTML5 standard to allow us to create self-contained blocks, optionally with captions, which can be referenced from other parts of same documents. "figcaption" elements are added in HTML5 standard to allow us to represent caption information inside "figure" elements. 1. "figure" elements are used to present reference blocks. 2. "figcaption" elements are optional elements that should have only text content and appear as the first or the last element of "figure" elements. 3. Multiple "figure" elements are allowed at the same level. 4. "figure" elements are allowed to be directly nested. 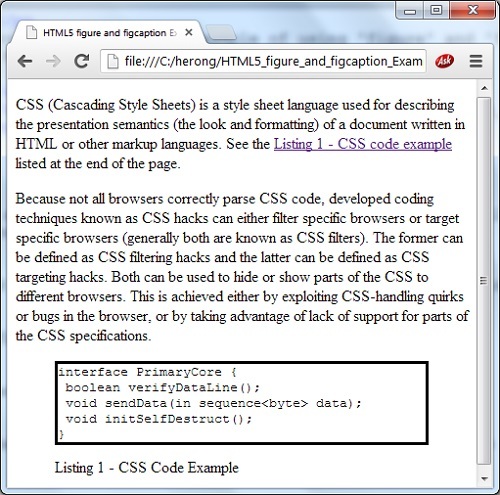 a document written in HTML or other markup languages. target specific browsers (generally both are known as CSS filters). advantage of lack of support for parts of the CSS specifications.